Imphal, February 14 2016: Yoga Guru Baba Ramdev laid the foun-dation stone of Manipur Ved Vidyapeeth today at Chaar Hazare of Senapati district, about 25 Kms from the State capital. MLA of Sekmai Assembly Constituency Kh Deven- dra, MLA of Thangmeiband A/C Kh Joykisan, president of BJP Manipur Pradesh Th Chaoba and trustees of the Ved Vidyapeeth attended the function. After conducting the rituals of the ceremony, Yoga Guru Baba Ramdev addressed the huge crowd. He stated that the 'Ved' has scientific importance and is universally accepted by all. He claimed that the 'Ved' is a secular platform for each and every community to do well for the better- ment of humans. He stressed on the teachings of Ved and chanted mantras with the crowd gathered there. The conceptual proposal of the Manipur Ved Vidhyapeeth was made by ADSYS architects and the Bharat Swabhiman and Patanjali Yog Samittee donated Rs 1 crore for the construction of the said school. Meanwhile, Th Chaoba showed his appreciations to Yoga Guru Baba Ramdev for his generosity and stated that the Manipur Ved Vidhyapeeth will give a boost to the education sector of Manipur. Kh Devendra said the educational institute will provide opportunities for students to have both spiritual and academic learning. 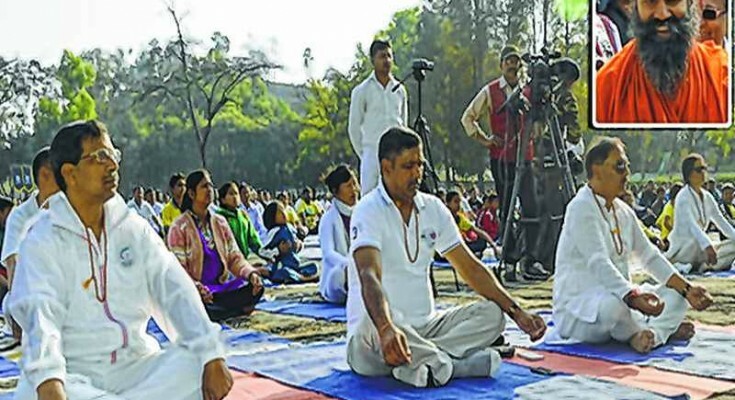 Later, Yoga Guru Baba Ramdev also visited the CRPF Group Centre (Nagaland and Manipur sector), Langjing and taught Yoga to officers of CRPF, jawans and family members of the CRPF personnel.